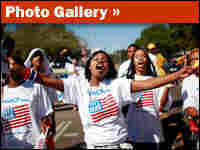 Va., Pa., Colo. May Hold Key In Election Democrat Barack Obama is making a play for reliably Republican Virginia. Republican John McCain is looking to make gains in traditionally Democratic Pennsylvania. Colorado is also up for grabs in Tuesday's presidential race. Sen. John McCain arrives at a Nov. 2 campaign rally at the University of Scranton in Pennsylvania. Sen. Barack Obama walks up the ramp to his plane at Pueblo Memorial Airport on Nov. 1 in Pueblo, Colo.
Forest Whorton of Castleton, Va., shows his support for Sen. John McCain by riding his horse along Route 29 on Nov. 1. People listen as Sen. Barack Obama speaks during a Nov. 2 campaign rally at Ohio State House in Columbus. 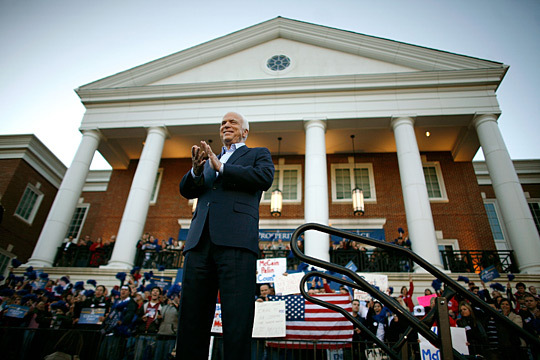 Sen. John McCain addresses a campaign rally in the David Student Union at Christopher Newport University in Newport News, Va., on Nov. 1. 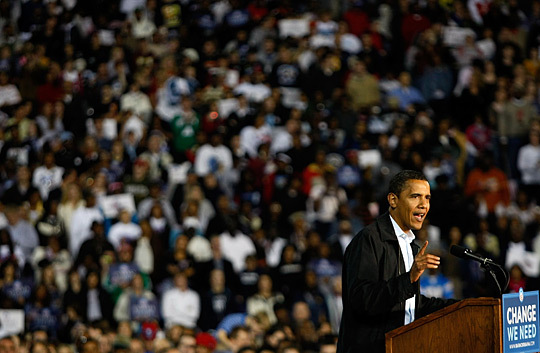 Sen. Barack Obama speaks during a campaign rally at the University of Cincinnati on Nov. 2. With just one day until the election, national polls continue to show Democrat Barack Obama leading Republican John McCain. But in the battleground states of Virginia, Pennsylvania and Colorado, the race seems much closer. There, the two candidates are vying not only for attention and airtime but for the support of undecided voters. They're crisscrossing these key states, holding last-minute rallies and relying on big-name surrogates. Virginia has not been won by a Democratic presidential candidate since 1964, but Democratic volunteer Greg Fawcett hopes to help change this. Fawcett is a California-based media consultant who has already volunteered in New York and Ohio for the Obama campaign. "Something I admired from the beginning was his asking sacrifice of people — even understanding, prior to the economic crisis, that it was a time that would require a lot of sacrifice. That's leadership to me," Fawcett said. 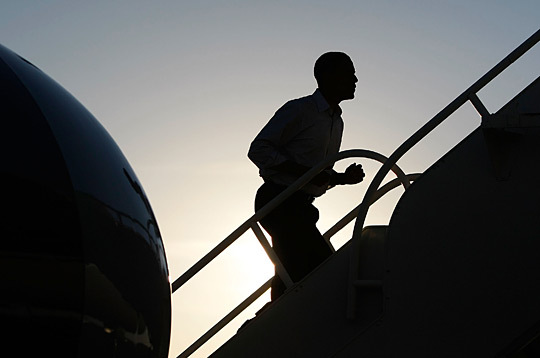 Obama has made Virginia's 13 electoral votes a prime target this year. He held his first rally after the convention in the state and will hold one of his final events in Manassas late Monday night. He has opened offices in places that have not seen a presidential campaign — much less a Democratic one — in years, and his campaign is hoping for a large turnout among African-American voters. But Republicans certainly have not conceded the state. At the McCain-Palin campaign office in Fredericksburg, a couple dozen volunteers work the phones. Doug Kulbalek is one of them. Kulbalek works for a defense contractor and said that a McCain win is crucial for the nation. "It will be a challenging time if we have a liberal — not a Democrat — a liberal in the White House, with a supermajority, superliberal majority in both houses of Congress," he said. McCain and his running mate, Alaska Gov. Sarah Palin, have each made several stops in the state, including a McCain visit over the weekend. McCain is hoping that the state's rural voters and the large number of retired and active military in Virginia will help buck the Democratic trend and keep the state red for one more presidential election. Pennsylvania is a state that has voted for Democrats in each of the last four presidential elections, but that has not stopped McCain from spending lots of money and time there. "We're a couple points behind in Pennsylvania. The pundits have written us off, just like they've done before. My friends, the Mac is back!!" he said at a recent rally. The McCain campaign has made four stops in Pennsylvania in the past three days alone, including an appearance on Sunday in the voter-rich Philadelphia suburbs. Statewide polls consistently show McCain trailing Obama — though the race has gotten tighter in the past few days. Supporters like Debbie Levinovich and Edgar Chinchilla believe McCain can still win. "I have friends and neighbors that all have McCain-Palin signs up on their lawns, and it's exciting to see," Levinovich said. "If we believe in polls, it will be no purpose for us to be here. According to the Democrats, this is over, and it's not over until the final results come up," Chinchilla added. From the Philadelphia suburbs, McCain was off to a rally in Scranton. He made another appearance on Monday in the state's southwestern corner. McCain will need a strong showing in all those areas to offset big Democratic majorities in Pittsburgh and Philadelphia. Obama himself has not set foot in Pennsylvania in several days, but the campaign has sent some high-profile surrogates to the area, including hip-hop mogul Jay-Z. "Martin Luther King walked so Obama could run. Obama's running so we all can fly. Philadelphia, make some noise!" Jay-Z told supporters. Jay-Z, along with Sean "Diddy" Combs and singer Mary J. Blige, were the headliners at a get-out-the vote rally earlier on Monday in North Philadelphia. Temple University students Tiffany Wilson and Kalima Thomas were there. "I think it's going to be a huge turnout. I think there's going to be plenty of people, long lines. I just hope everyone comes out and votes," Wilson said. Analysts say neither candidate will have an easy time winning without Pennsylvania's 21 electoral votes. The largest block of voters in Colorado does not belong to any political party, and these unaffiliated voters decide the state's elections. In recent years, they have been swinging toward the Democrats. Polls over the past few months show that Obama has consistently held a slim lead over McCain. Richard Mont is a registered "unaffiliated" voter, or independent, who lives in Denver. "I think people are just tired of the Republican ticket," he said. "I think they're tired of the Bush policies, and I think people believe that President Bush and all his cronies got us into this situation." Unaffiliated voters in Colorado rarely mention Obama's qualifications as a reason they're supporting him. Instead, they often express frustration with Republicans over the poor economy and the languishing war on terrorism. 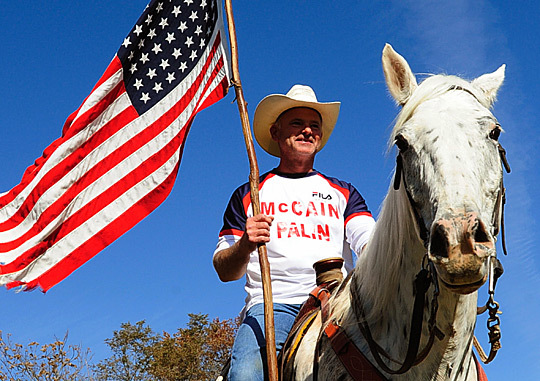 There are some parts of the state where McCain has very strong support. On Monday morning, Palin addressed an enthusiastic crowd in Colorado Springs. The city is home to dozens of evangelical Christian groups. Palin is very popular with conservatives and some unaffiliated voters, like Jack Graves of Arvada. "I just liked her. She's just sort of like one of us," he said. "She's down-to-earth and not so political." Both Graves and his wife, Karen, have already cast their ballots for McCain, in part because, they say, they appreciate his stance on abortion. But they also fault the McCain campaign for not doing a better job of attracting independent voters. "I don't know who his strategist is, but I think they've given him really bad advice," said Karen Graves. "I just don't think he's out there. The things he's coming across with are too negative. He's not coming across to me as down-to-earth as Obama does in his campaigns in reaching the people." 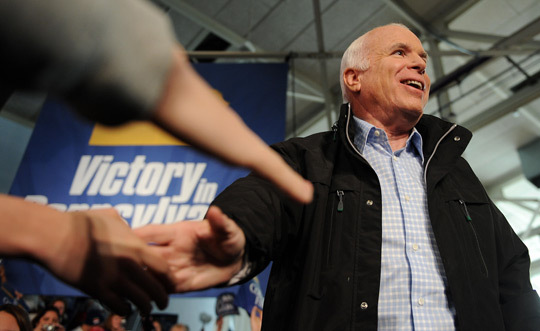 After Palin's Colorado visit on Monday, McCain will be in Grand Junction on Tuesday for an Election Day rally. Mesa County is another Republican stronghold in Colorado. It has not voted for a Democratic presidential candidate in over four decades. McCain supporters hope that a high-profile visit just hours before the polls close will encourage a few stragglers to go and cast their ballots at the last minute. Swing State Reports: Ind., Nev., N.C. And Fla.
As many people remember from the year 2000, a presidential candidate can lose the nationwide vote and still win the election. The presidential vote is one that's decided state by state. No matter who wins, the number of red and blue states on the electoral map will help determine the momentum that the winner takes to the White House. But several states, including Indiana, Nevada, North Carolina and Florida, are neither red nor blue this year — they're too close to call. Indiana is traditionally considered the reddest of the Midwest states, favoring Republicans in 24 of the last 28 presidential elections. Since 1940, a Democrat has carried Indiana only once — in 1964. Four years ago, President Bush won a whopping 60 percent of the Indiana vote. "I cannot recall an election cycle where this state has been up for grabs in the general election and therefore being paid attention to," says Marie Eisenstein, a political scientist at Indiana University-Northwest in Gary. She says the senator from neighboring Illinois, Barack Obama, has a chance to become the first Democrat to win the state in 44 years. "This would be a huge coup for the Democrats, to be able to turn Indiana from a red state to a blue state," she says. If Obama wins Indiana, it will be due at least in part to huge turnout in the one reliably Democratic county in the state, Lake County, which borders Chicago. Voters there, like Joanne Borrow of Gary, have been waiting two to three hours in line to vote early and make history. "I'm ready for the Republicans to get out of the office. I'm ready to vote. I can't wait to vote," she says. With the second-largest population in the state, a huge turnout in Lake County for Obama could offset lopsided margins for John McCain in rural counties in central and southern Indiana. But Republicans are far from throwing in the towel. "The election's not happened yet," says Russ Volk, manager of the aptly named Conservative Cafe in Crown Point, about a dozen miles south of Gary and where coffee is served "right." Volk says the seasoned Indiana GOP is mobilizing. "I think the rest of the state ... [is] going to make more difference this time than ever before," he says. "Midstate, southern Indiana, I still think they're traditionalists." Another factor to consider is that Hoosiers have a tradition of splitting tickets, voting for Democrats for offices like governor, senator and representative while voting for Republicans for president. That could work in the reverse this year, as Republican Gov. Mitch Daniels is expected to win re-election Tuesday. Some homes with Daniels yard signs have signs supporting Obama next to them. In Las Vegas, the 60,000 members of the Culinary Workers Union are a force to be reckoned with at election time. Clester Nelson, 74, is one of the union's hundreds of canvassers. 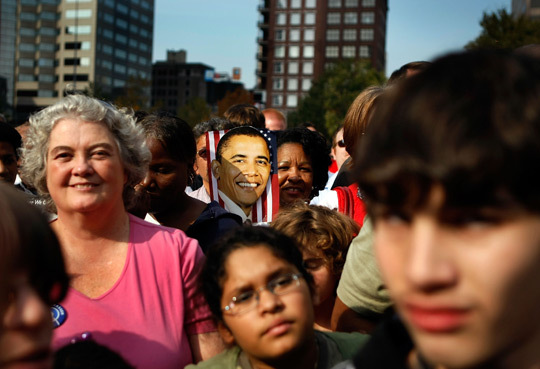 As he was setting out from the union hall Sunday, he said that electing Obama would be the fulfillment of a family prophecy. "My grandfather ... was a slave, and when I was about 8 years old, he said, 'Son, maybe by the time you get to be an adult, they'll have a black president,' " Nelson recalls. There are now more Democrats for Nelson to contact than there were just a year ago. Democrats have overtaken Republicans in voter registration by a margin of more than 100,000. Meanwhile, the state has been hit hard by the economic crisis. The unemployment rate is above the national average, and the state has the highest foreclosure rate in the country. Nelson says that's on the mind of everyone he meets. "You bump into people [who] will tell you, 'I've got to move and I really don't know where I'm going to move because I don't have any money. I lost my job,'" Nelson says. Las Vegas has always provided the mother lode of Democratic votes in Nevada, while Republicans hold sway in the state's rural counties. But McCain has his backers in the Las Vegas area, too. Some of his evangelical supporters spent Sunday afternoon gathered in a hotel ballroom south of the strip, listening to speakers including the Rev. John Knapp. "Do every single thing that you can to make sure that the biblical values that this nation [was] founded on are pushed forwards in this next election," Knapp said. What Craig and Scheryl Smith have been doing for McCain is praying. "Lord, please have mercy on us as a nation, and please have Mr. McCain be president," Craig Smith prayed Sunday. "Our pastor likes to say that prayer is the work. You can go out and do all these hands-on things, but prayer is what is the real work," Scheryl Smith explained. But leaving nothing to chance — or heaven — McCain and his running mate, Sarah Palin, will each hold rallies in Nevada on Monday. North Carolina has been a red state in each of the last seven presidential elections. If that changes this year, newcomers like Melissa Coleman will be part of the reason. Coleman moved from Massachusetts to North Carolina earlier this year with her husband and kids, settling in a recently built subdivision in the sprawling suburbs of Raleigh — the nation's third-fastest-growing metropolitan area. She says most of her neighbors are equally new to the state, and they have brought some new political attitudes with them. "The politics of North Carolina are changing dramatically," she says. "I mean, people are flocking in here from, you know, New England and pretty much Pennsylvania and up, so [that] we're actually considered a swing state is a pretty big surprise for me, for sure." The county that includes Raleigh and its suburbs went for President Bush in the 2004 election, but polls suggest Obama has a double-digit lead in it now. To overcome Obama's strength in fast-growing urban areas, McCain has to do well in rural communities and more established parts of North Carolina. And he has to motivate members of the Republican base, such as 75-year-old Correnn Watkins, who cast an early ballot for McCain last week. "I'm a Southern Baptist, so I am conservative. In fact, we pray every night at 9 for the nation and that McCain is elected," Watkins says. Statewide polls show the North Carolina race as too close to call, so the number of newcomers who vote versus the number of longtime residents may determine whether Watkins' prayers are answered. The math in Florida is simple: Democrats usually carry South Florida; Republicans dominate the north. The central part of the state — what's called the I-4 corridor — is the battleground where elections are decided. Democrats have registered twice as many new voters this year as Republicans and hold a 650,000-voter edge statewide. The question is: How many of these new voters will turn out on Tuesday? It's a close race in Florida, but Diane Hansborough, who supports McCain, says she's not worried about the polls. "No, you have to keep fighting and you have to go out, you have to knock on doors," she says. "You have to get people as much as you can to understand how bad it would be if we get Obama. And I firmly believe that." In Florida, 1 out of every 4 voters is older than 65. McCain has enjoyed some of his strongest support among senior citizens, but recent polls suggest it's eroding. Among the factors cited: the worsening economy and his selection of Palin as his running mate. "Sometimes, I look at McCain and I like him, but I worry because his health is not the best and his age isn't," says Helen Rutledge, a retiree who lives in Boca Raton. "And I don't think an inexperienced little girl from Alaska should step into the presidency." Because it's Florida, all eyes will be watching for voting snags Tuesday. Expect plenty of lawyers at the polls.